Jamyang Khyentse Chökyi Lodrö (Tib. འཇམ་དབྱངས་མཁྱེན་བརྩེ་ཆོས་ཀྱི་བློ་གྲོས་, Wyl. ‘jam dbyangs mkhyen brtse chos kyi blo gros) (1893-1959) was an activity incarnation of Jamyang Khyentse Wangpo, and perhaps the most outstanding Tibetan master of the twentieth century. Authority on all traditions and holder of all lineages, he was the heart of the Rimé (ecumenical) movement in Tibet. He was the master who recognised Sogyal Rinpoche as the incarnation of Tertön Sogyal and brought him up. He was born in 1893 at a place called Sa-ngen or Rekhe Ajam, near Kathok Monastery in eastern Tibet, south of Derge. His father was Gyurme Tsewang Gyatso of Amdo and was a tantric master. His mother was Tsultrim Tso. In 1900 at the age of seven, he was brought to Kathok Monastery, and Katok Situ Chökyi Gyatso recognized him ceremonially as the activity emanation of Jamyang Khyentse Wangpo. In the following years of his youth he was tutored by Khenpo Thupten in grammar, astrology, Sanskrit, and in Buddhist philosophy. By the time he was thirteen he had received the transmission of the Longchen Nyingtik, the Nyingtik Yabshyi, and an introduction to Dzogchen meditation. When he was fifteen he moved to Dzongsar Monastery, the seat of the previous Khyenste Wangpo. He studied Abhidharma and Madhyamaka philosophy, and soon began teaching Buddhist texts to several students there. From the time he was seventeen, he received Sakya school transmissions such as Lamdré Lopshé and the Hevajra Tantra, and many Nyingma terma teachings. In 1919, when he was twenty six, he went to Dzogchen Monastery and received ordination as a monk. Later in the same year he established a shedra at Dzongsar Monastery. 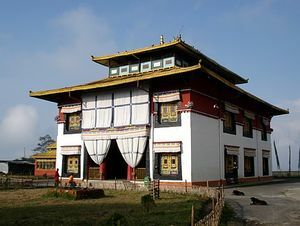 At Shechen monastery, he received a number of transmissions from Shechen Gyaltsap Gyurme Pema Namgyal, who became one of his principal masters. The next few years of his life he visited many monasteries of the four main schools of Tibetan Buddhism, and received transmissions and lineage teachings from various teachers. Then in 1926 he went on a pilgrimage to Central Tibet, and at the main Nyingma monastery of Mindroling took ordination as a monk for a second time. Just before he returned to his home region in Eastern Tibet, Kathok Situ Gyatso of Kathok Monastery died. After this, for the next fifteen years Chökyi Lodrö took part in the administration of Kathok Monastery, which is home of the Kathok lineage teachings of the Nyingma. He continued to perfect, and accomplish the meditations and the sadhanas of all the Tibetan traditions, becoming a true Rimé master, who was able to teach both analytical philosophy and the performance of practices leading to realization from the various lineages. In the 1940s he studied with the leading Vajrayana masters from all over Tibet, and continued receiving transmissions from the Gelugpa, Nyingma, Sakya and Kagyü schools. 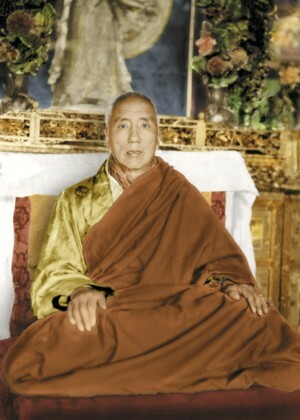 He developed a reputation during that era as being a Rimé master par excellence, and many of the new generation of Lamas who would bring Tibetan Buddhism to the West began to see him as their master. Thus he became a teacher and guide for Dilgo Khyentse Rinpoche, Dezhung Rinpoche and Sogyal Rinpoche. He was a major influence on a very young Chagdud Tulku Rinpoche, who first met him in 1945, and he is also mentioned with awe by Tulku Urgyen Rinpoche in his biography. He became seriously ill in 1949, when he was fifty six years old. According to the prophecies of Khyentse Wangpo, of Jamgön Kongtrul Lodrö Thayé and from his own prophecies, in order to remove obstacles to his longevity, and so he could continue to teach Dharma, it was necessary for him to take a spiritual consort. He married Khandro Tsering Chödrön (b. 1929) that same year, and rapidly recovered his health. In 1955 as the situation for monasteries continued to worsen in Eastern Tibet, he traveled to Lhasa. While there, he was invited to Tsurphu to give teachings and empowerments to the 16th Karmapa, Rangjung Rigpé Dorje. In turn the Karmapa gave him an empowerment in the red form of Avalokiteshvara, a historic, personal yidam of the Karmapas. In Lhasa he stayed at the Samdrup Podrang and had several meetings with His Holiness the Dalai Lama at the Potala Palace. At Mindroling he gave the empowerment of Nyingtik Yabshyi. He also visited Sakya Monastery, where he gave the most important Lamdré transmissions in the great temple hall. He then commenced a pilgrimage to India. He visited sites sacred to Buddhism in Nepal and India, and then at the invitation of the King of Sikkim, took up residence in the Palace Monastery in Gangtok, Sikkim. In the final four years of his life, the Palace Temple where he resided became a spiritual center. By this time he was known as a Master of masters, and his presence attracted many lamas from Tibet, who came to receive transmissions from him. According to Tulku Urgyen Rinpoche one could ask him for clarification about some point, in any of the termas from any of the numerous lineages, and he always had an answer. At the age of sixty-seven, in early 1959 with the Chinese Communist invasion of Tibet underway, he again became seriously ill. Prayers and rituals for his long life were performed day and night, by all the lineages in Sikkim. Despite these devoted spiritual efforts, he died. According to Sogyal Rinpoche he died in the 'sleeping lion's posture', a yogic posture, and remained in a subtle meditative state for three days. His body was kept in state for six months, as disciples throughout the Himalayas came to pay their respects. His body did not display the usual signs of decomposition during this time. His cremation was performed at a stupa at Tashiding, Sikkim, and his remains are kept in the Royal Chapel of Sikkim. He gave several empowerments at the Samdrup Podrang in Lhasa, including the Chetsün Nyingtik and the Nyingtik Yabshyi. The latter was given only to 25 invited lamas and guests. He gave the empowerment of Rigdzin Düpa in Patan in Nepal. At Mindroling, he gave the Lama Yangtik and Khandro Nyingtik from the Nyingtik Yabshyi. In 1961 (?) Dzongsar Khyentse Rinpoche was born in Bhutan, and was immediately recognized as the incarnation of Dzongsar Khyentse Chökyi Lodrö by Sakya Trizin, Dilgo Khyentse Rinpoche and other lamas. He was enthroned by Dilgo Khyentse Rinpoche in the Palace Monastery in Gangtok on 2 September 1968. Also see Khyentse Incarnation Line for other incarnations. ↑ See the Preface to The Tibetan Book of Living and Dying. ↑ Jamyang Khyentse received this name from Dodrupchen Jikmé Tenpé Nyima during an empowerment of Rigdzin Düpa. It is often taken as an indication that he was also an incarnation of Do Khyentse Yeshe Dorje. See Masters of Meditation and Miracles, p. 245. Dilgo Khyentse, Brilliant Moon: An Autobiography of Dilgo Khyentse Rinpoche (Boston & London: Shambhala, 2008), Ch. 7, 'Teachings with Khyentse Chökyi Lodrö'. Nyoshul Khenpo, A Marvelous Garland of Rare Gems: Biographies of Masters of Awareness in the Dzogchen Lineage (Junction City: Padma Publications, 2005), pages 296-306. Tulku Urgyen Rinpoche, Blazing Splendor: The Memoirs of Tulku Urgyen Rinpoche (Boudhanath, Hong Kong, Esby: Rangjung Yeshe Publications, 2005), pages 297-303. Tulku Thondup, Masters of Meditation and Miracles (Boston: Shambhala, 1996), pages 245 & 278-282. This page was last edited on 21 March 2018, at 13:42.